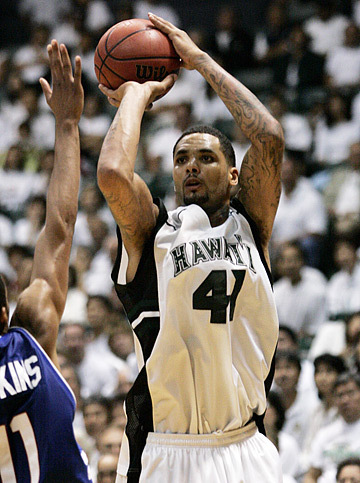 Julian Sensley is shown in a March UH game. Julian Sensley isn't banking on getting a call during tomorrow's NBA Draft, but he's still planning on a busy summer. With a direct path to a roster spot unlikely, the former Hawaii forward will have to take the free-agent route and hopes to sign a contract shortly after the draft, which could then lead to a spot in one of the NBA's summer leagues and a shot at working his way into the pros. He said he has also completed the process to receive a German passport, enabling him to play for the national team in tournaments abroad. "I've got some good basketball ahead of me this summer," Sensley said. Sensley is eligible for German citizenship through his mother, Susanne Karsten, who retained dual citizenship when she moved to the U.S.
Dallas Mavericks star forward Dirk Nowitzki has been the centerpiece of the German national team, which also recently added former North Carolina player Ademola Okulaja. The team is slated to play in several tournaments leading up to the world championships in August in Japan. "I just turned in my paperwork for all that," Sensley said. "They were jumping through hoops for me to get it, and now I'm a German citizen, which is kind of cool. So I'll be able to play with them." After completing a three-year career at UH in March, Sensley spent more than a month in Los Angeles preparing for his shot at the pros. He had several workouts for NBA scouts while in California, and was an alternate for the league's pre-draft camp in Florida earlier this month but did not get an invitation. The 6-foot-9 forward is back home in Kailua and remains hopeful that he will get a chance to impress NBA personnel in the summer leagues that annually feature rookies and free agents trying to work their way onto a roster. "If I get in the summer league and I'm able to perform well there, and hopefully get invited to somebody's camp in the fall and try to make a team from there. That's my goal," Sensley said. Sensley was a first-team All-Western Athletic Conference pick as a senior and was named the Rainbow Warriors' most outstanding player for the second straight season. He led UH in scoring with 17.6 points per game and was second in rebounding (5.8 per game) and assists (3.2 per game). While the team workouts gave him a chance to perform for scouts in a controlled setting, the summer leagues offer players an opportunity to show off more of their skills within the flow of a game. "Workouts are more drills and individual things, and they don't get to see much," he said. "Somebody could really do well at drills, but when it gets into an open-court situation where you have to run the floor and you have to pass and all that stuff, it's a little different." Since he has been back home, Sensley said he has spent his early summer keeping his game in shape and working on his conditioning. "Just a lot of running," he said. "I'm really just trying to be in the best shape of my life . I've put on some weight, got a little quicker, added some endurance." Louisiana Tech forward Paul Millsap is hoping three seasons as the nation's top rebounder will be enough to warrant a pick in the draft. The junior entered early and signed with an agent to end his college career. Nevada forward Nick Fazekas and Boise State guard Coby Karl also entered early but withdrew their names prior to the deadline.